I named it "Lucky Eho-Maki" because I used seven lucky ingredients including lucky colors such as red and yellow: smoked salmon, corn, onion, baby leaves, avocado, mustard mayonnaise, and cracked black pepper. February 3rd is Setsubun. It is the day before the beginning of Risshun (spring season). On Setsubun, we cleanse away all the evil of the former year and drive away disease-bringing evil spirits for the year to come. This special ritual is called Mamemaki (bean scattering). On this day at night, it is customary now to eat uncut maki-zushi called Eho-Maki ("lucky direction roll") while facing the yearly lucky compass direction, determined by the zodiac symbol of that year. 1. Place cooked Japanese rice in a bowl. Add Sushisu while the rice is hot and slice through rice using rice paddle to separate the grains. 2. Cover the bamboo sushi-roll mat with plastic wrap. Place nori sheet on the bamboo sushi-roll mat, shiny side down. 3. Spread sushi rice (1.) on the nori sheet using your finger tips, little bit moistened with water. 4. Place A lengthwise on the nori sheet. 5. Roll the bamboo mat forward, hold the line of ingredients firmly with your fingers, make sure all the ingredients are pressed in, roll it completely, and gently press the mat around the roll to shape it (do not squeeze). You want to eat uncut sushi roll, so don't cut it. You can of course make it smaller!!! 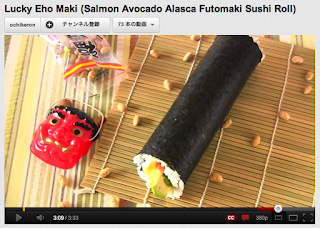 How to eat the Eho-Maki is HERE.